We’ve never minded Tim Tebow the player, it’s always been the hoopla that continually surrounds him that has grated on us. 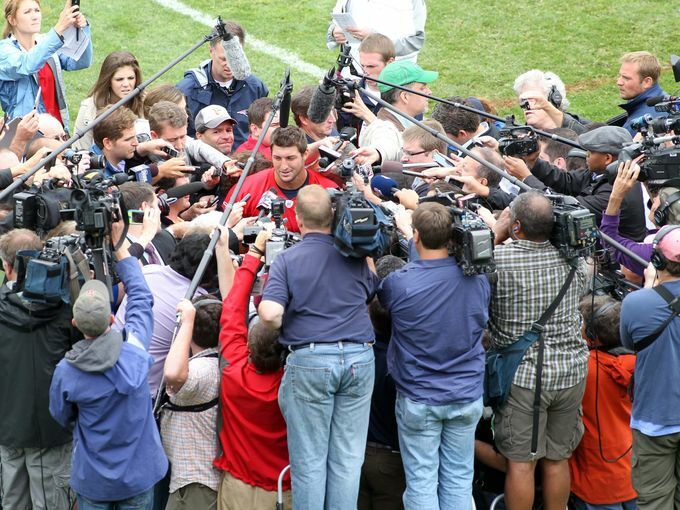 And that hoopla reached a higher level the past couple of days after Tebow signed a two-year contract (with no guaranteed money) with the New England Patriots, with more than 80 media credentials issued for New England’s mini-camp practice on Tuesday. It got even better on Wednesday when New England coach Bill Belichick was asked how much “improvement” Tebow had made from Tuesday to Wednesday. So rather than be part of the solution and just ignore all the mindless noise, we decided to join in, be part of the problem, and offer up a few thoughts on Tebow the NFL player. First off, unless he blows out his ACL again (it may even take both ACL’s being shredded), there is about as much chance of Tom Brady coming off the field so Tebow can run some plays as their is of Brian Robiskie turning into a legitimate NFL wide receiver. In his career, Brady has never completed fewer than 60 percent of his passes, has averaged 4,065 passing yards per season and has not posted a quarterback rating under 95 in a full season since 2006. This isn’t Brady Quinn coming out of a game so Josh Cribbs can run some plays out of the Wildcat; it’s Tom Brady. It’s not happening. Next comes the notion that the Patriots are “grooming” Tebow to take over for Ryan Mallett once Mallett is traded or leaves in free agency. So rather than work with Mallett, who is allegedly a talent the likes of which has not been seen in decades, as the successor to the soon-to-be 36-year-old Brady, the Patriots will focus on Tebow? Belichick may not have won a Super Bowl since 2005 and never developed a quarterback not named Tom Brady, but he’s not stupid. There is also the idea that the Patriots can just turn Tebow into a tight end or a fullback, despite the fact that he has been a quarterback his entire career (just ask Josh Cribbs how easy it is to switch positions). Let’s say Tebow moves to tight end; there’s still the same problem as the quarterback position. If you put Tebow on the field, who are you going to take off between Rob Gronkowski and Aaron Hernandez? As The Globe story points out, Tebow never played those positions until last year with the Jets and he wasn’t very good at it when New York tried to use him at something other than quarterback. He’s not a skilled route runner (again, talk to Cribbs) and in one game against Miami the Dolphins specifically targeted Tebow on special teams and ended up blocking a punt for a touchdown. Again, this is nothing against Tebow. Plenty of successful college players have failed to find that same success once they come to the NFL. He’s just the latest in a very long line. In a lot of ways, Tebow is the Eric Mangini of quarterbacks – someone who’s supporters work so very hard to try and convince everyone that he is talented despite there being no statistical evidence to support their position. The best part of all of this is that Tebow is in Boston and not Cleveland, so we can watch the circus play out for as long as it lasts without having to worry about it having any lasting impact on the Browns.